“1989” has become shorthand both for the triumph of human rights over state-socialist dictatorship and the subsequent implementation of a “neoliberal” reform agenda. Yet the coalescence of these two phenomena in Eastern Europe twenty-five years ago is quite surprising once we focus on the prehistory of 1989. Following the crooked paths that led to the annus mirabilis is thus a great opportunity to assess the transformation of human rights discourses during the 1980s. 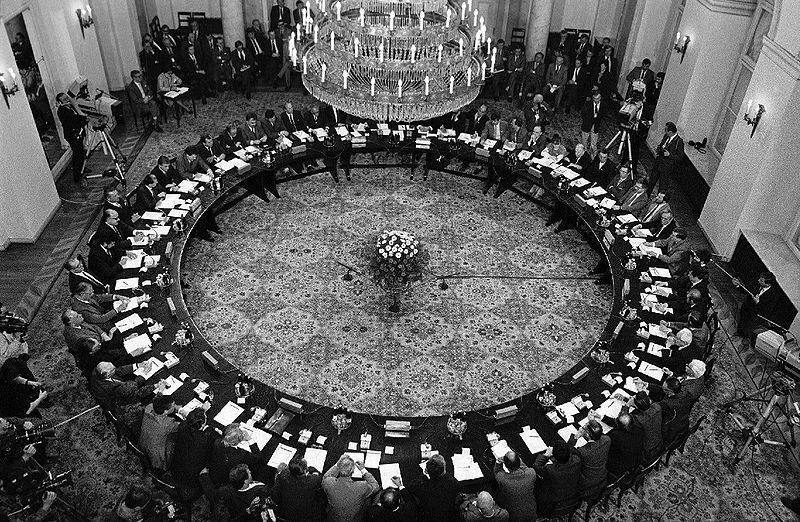 Twenty five years ago, on 6 February 1989, representatives of Poland’s government and of the illegal democratic opposition began negotiations on political and economic reforms. Inaugurating their meetings at a round table that had been crafted specifically for this occasion, they set events in motion that became a major catalyst for the collapse of the “Soviet bloc.” As we look ahead to a series of events celebrating “1989,” Samuel Moyn’s post from December—urging us to think about connections between the rise of human rights and of “neoliberalism”—may thus prove timely because few events exemplify the coalescence of these two discourses more clearly than the end of the Cold War. On one hand, “1989” meant an enormous boost for human rights: The collapse of the state-socialist regimes in Central Europe seemed to vindicate the so-called “dissidents”—embattled intellectuals who had spent the 1970s and 1980s in and out of prison, working unskilled jobs and drafting human rights petitions or learned essays on totalitarianism at night. The dissidents, to be sure, did not cause the collapse of Communism, but they did become the figureheads of the protest movements that toppled the regimes in Central Europe. The subsequent expansion of international human rights treaties, the democratization of many post-communist countries and their later EU accession all have dramatically increased the respect and protection of individual liberties in Europe and worldwide. On the other hand, post-Communist Europe also became a staging ground for reform programs based on “neoliberal” ideas. This is readily apparent in post-Communist economic transitions—especially in the (in)famous “shock therapy”. But political reforms, too, were informed by an understanding of voters and politicians as “homines economici” competing on a political market. Transitions to democracy—once considered the result of a long process of economic modernization and social change—were now believed to be merely a matter of designing political institutions in a way that would channel the (market-like) competition of self-interested, rational political actors. Noting this coalescence, it is important to avoid a major problem related to understanding “1989”: Given the suddenness with which the seemingly ironclad division of Europe unraveled, events of that year acquire an air of inevitability—“everything was forever, until it was no more,” as Alexei Yurchak put it. Competing attempts to claim the “victory” in the Cold War for one’s favorite historical actor or event—Ronald Reagan, John Paul II, Václav Havel, the signing of the Helsinki Agreement—did their share to accentuate an understanding of “1989” and its consequences as the final point of a larger scheme or plan—a neoconservative revolution, a religious renewal, a renaissance of civil society, European integration. Yet even as the Polish round table talks began twenty five years ago, the division of Europe appeared as immutable as the division of Korea appears nowadays, and the protests that erupted throughout 1989 were as unexpected as was the “Arab spring” of recent years. The coalescence between human rights ideas and “neoliberalism,” too, was far from inevitable. Indeed, it turns out to be very surprising once we focus on the crooked paths along which the “dissidents” came to embrace human rights language. Much as the Soviet “rights defenders” struggled and suffered for individual liberties, few, if any, of them criticized socialism and its broad range of social guarantees, as Benjamin Nathans has shown. 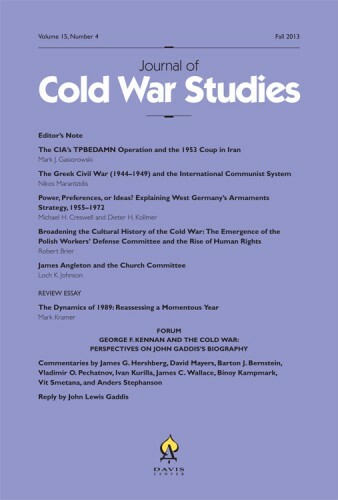 In a rece ntly published article in the Journal of Cold War Studies I discuss how Polish human rights activists of the late 1970s—many of which saw themselves as democratic socialists—viewed Eurocommunist parties as well as the unorthodox Western Left as their main international audience. The Polish Solidarity movement—by far the largest opposition force in Eastern Europe—was a trade union advocating workers self-management and demanding that the state provide a social minimum for every citizen. The personalist philosophy of John Paul II also hardly qualifies as “neoliberal” and even less so does Aleksander Solzhenitsyn’s mysticism and Russian nationalism. Looking beyond Eastern Europe, the connection between “neoliberalism” and human rights becomes even more surprising. “Neoliberal” ideas were first implemented on a broader scale in Chile under the auspices of Augusto Pinochet—the very man who was the target of a paradigmatic early human rights campaign (see Jan Eckel). The South African struggle with Apartheid was as much a struggle with a specific economic system as a struggle for individual rights. The ANC had cooperated with the Communist party (of which Mandela was a member), and Western campaigners against apartheid were often driven by a radical critique of Western societies, as Simon Stevens demonstrates. Much as I find the thesis convincing, then, that the upsurge in human rights activism during the 1970s was prompted by a collapse of other ideologies, I also came to realize that the first human rights campaigns still very much bore the traits of what had come before. These campaigns remained closely connected to struggles for collective self-determination and social transformation. The iconic causes of human rights culture—whether from Chile, South Africa, or Poland—kindled international support because western supporters saw in them a social template which, at the very least, might help to bring out an unfulfilled potential of democracy. The renaissance of the idea of a “civil society”—which Western intellectuals projected unto Solidarity and Charta 77—is one product of such hopes. 2014, then, may be a good year to commemorate not only how human rights triumphed in 1989, but also to think about how their meaning was shaped and transformed in the process. This requires, I believe, a broadening of the debate on human rights recent history to include not only the 1970s, but the 1980s and 1990s as well—that crucial time “when a variety of groups around the world, and all governments, learned to speak the language” of rights, as Moyn puts it. For want of a better term, I use “neoliberalism” to denote a discourse that emerged in the West in the 1970s. It involved two things: first, a new way of thinking about economics in which markets were seen as spheres of interaction which emerge spontaneously from the rational and self-interested activities of microeconomic actors and, second, an intellectual movement that applies this model of action to all spheres of social life.